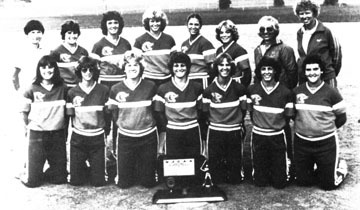 The 1982 ICC softball team took a 21-11 record to Rockford as it opened its bid for a national title with great baserunning speed and pitcher Deanna Hacker as its chief weapons. And because Hacker pitched four consecutive shutouts, the national crown was brought to the school's East Peoria campus. In succession, ICC disposed of Kirkwood, Iowa, 2-0; downed Erie, N.Y., 7-0; toppled Lake Michigan College of Benton Harbor, 6-0 and then edged Central Arizona College 1-0 in the title game. Hacker became the first pitcher in tournament history to hurl four shutouts, allowing just 14 hits, walking none and striking out 15. She was voted most valuable player. "She dominated the tournament," said Ramsey at the time. Ramsey was assisted in molding her national champions by assistant coaches Karen Guthmiller and her long-time catcher when she was one of the nation's standout pitchers with the Pekin Lettes, Eleanor "Rudy" Rudolph. Along with Hacker, the team was composed of Paula Buscher, Cyndi Hoffman, Leslie Miller, Julie Compton, Jan Christiansen, Julie Micheletti, Caryl Moehring, Stacy King, Lisa Cantor, Julie Conway, Ken Hanson and Laurie McDonough.